FitnessGram | Live Healthy S.C.
Impacting nearly 35,000 state employees, the new A Healthier State initiative is promoting improved health by providing comprehensive baseline worksite assessments, model policies, and wellness consultation services to the S.C. Governor’s Office, all 16 cabinet agencies, DMH, and DHEC. The South Carolina Academy of Physician Assistants (SCAPA) recently hosted a video-conference entitled: “A How-To for South Carolina Physician Assistants: Communities & Practices Join the Obesity Fight.” The event highlighted the 2015 County Health Rankings and the SCale Down Initiative and provide training on the Let’s Go! 5-2-1-0 Childhood Obesity Toolkit. With the help of a $2.5 million grant from the BlueCross BlueShield of South Carolina Foundation, DHEC is coordinating the statewide implementation of FitnessGram. Potentially reaching over 740,000 SC public school students, this project will allow students to set their own health goals, help school administrators to make policy choices for physical fitness and offer a place to track student-specific data. 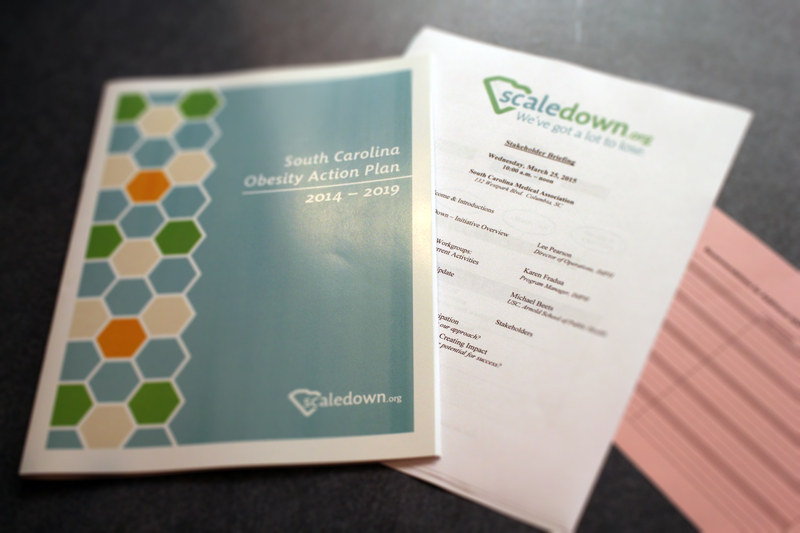 SCale Down is a collaborative initiative that connects and engages partners to achieve the objectives outlined in the state’s Obesity Action Plan and helps eliminate duplication of efforts. If you are interested in learning more about SCale Down or in getting involved in the initiative, please visit www.scaledown.org. Partners from across the State gathered at the SC Medical Association on March 25, 2015 for a SCale Down Initiative Stakeholder Briefing. This entry was posted in Prevention and tagged A Healthier State, Childhood Obesity Toolkit, FitnessGram, obesity, Obesity Action Plan, SC Obesity Action Plan, SCale Down, scaledown.org, South Carolina Academy of Physician Assistants on April 9, 2015 by SC DHEC.